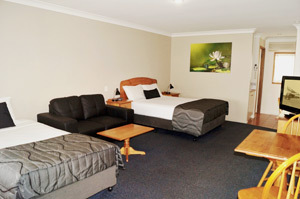 Asters on James Motor Inn is 3½ Star accommodation located in the heart of Toowoomba, the Garden City. Toowoomba is a 2 hour drive from Brisbane and 2 ½ hours drive from the Gold Coast, both with international airports. 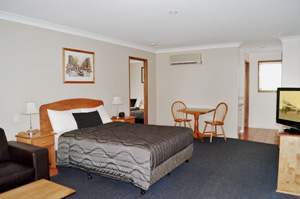 The motel is 17 km from the Brisbane West Wellcamp Airport, Toowoomba. Asters on James Motor Inn is just a 100m stroll to the Toowoomba Base Hospital. As the closest motel to the hospital, Asters on James Motor Inn offers free hospital parking for in-house guests. 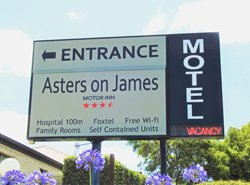 Asters on James Motor Inn offers central access to all of Toowoomba’s shopping precincts, restaurants, sporting venues and night life. Asters on James boasts 16 spacious, comfortable, ground floor accommodation options with undercover parking. Our motel includes Queen, Twin and Family rooms, One and Two Bedroom self-contained apartments, and rooms with Disabled Facilities. We offer after hours check-in, a guest laundry, complimentary wi-fi, 8 channels of cable TV and home-style room service meals for breakfast and dinner. Alcoholic beverages are available from Reception at below bar prices. Toowoomba Base Hospital is within walking distance and the Toowoomba City Centre is only 5 mins by car or a comfortable 10 minute walk. A public bus stop is conveniently located at the front of the motel. A small shopping centre with a choice of takeout meals is across the road.